Cuticle oil is absolutely essential to any good hand/nail care routine, and my two most recent additions come from New Zealand-based company, Arcadia. I was able to grab these on a promo posted by the owner on Facebook. 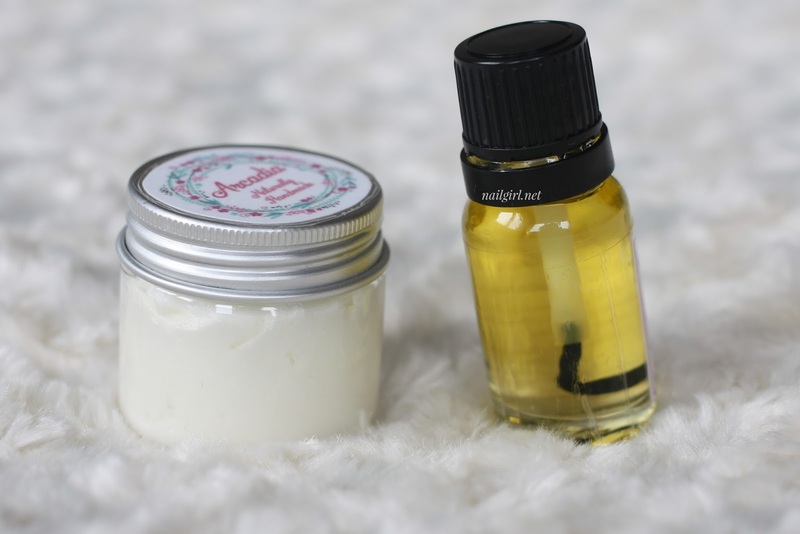 The products themselves come in an amazing variety of scents (which I love, because most commercial cuticle products are unscented or just not in scents I like). The owner is able to provide products in such a wide range because they are made to order, if I'm not mistaken. The butter is very airy with a whipped texture. I love that it's a MASSIVE tub in comparison to Burt's Bees cuticle butter, but I worry that it will become annoying and unhygienic to get product out of as I use it up. It's more travel friendly than the cuticle oil for obvious reasons, and I like having it with me in my bag. I find that the Vanilla Hazelnut scent is much stronger than that of the cuticle oil, and I'm not sure why this is! The cuticle oil comes in a glass vial with a brush attached to the lid. However, the brush is far too long and as a result, the brush itself is squashed and deformed at the bottom. This makes application kind of annoying as the bristles are splayed out every which way. I'm definitely planning on trimming the bristles - I recommend doing so as soon as you receive the product. The Toasted Marshmallow scent is MUCH more subtle than the Vanilla Hazelnut, but it's still strong enough for my fiancé to say that something smells "like cookies" when I open it around him. Both of them hydrate and moisturise my cuticles and nails VERY well, and I highly recommend them to anyone looking for new cuticle care to try! What are your favourite cuticle products?